For this shoot, I wanted to have some fun and create the quintessential “rock out” portrait and challenge myself by only using one light. My assistant, James, agreed to model for the shoot, though he confessed he didn’t really play the guitar. Still, he was game. 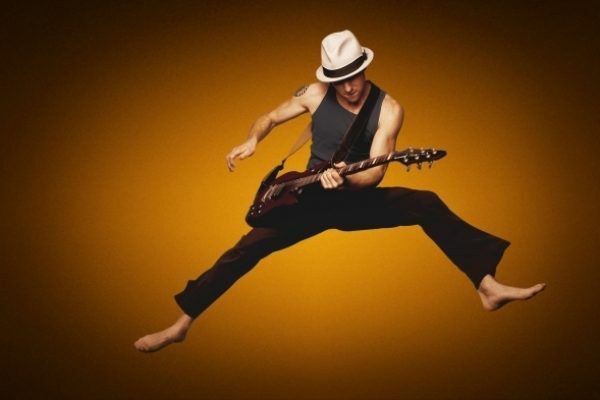 I wanted to capture James mid-air doing his best Pete Townsend jump. I wanted to keep the lighting on him simple, but have it be dynamic enough so that I could easily superimpose him onto a separate background. The lighting would also need to be powerful enough to freeze him mid-air. Rather than use a studio strobe, I used two speed lights with hardware that allows you to mount two units and wireless receivers inside a single softbox. THis allowed me to create a large soft light source without being tethered to an electrical power source. James set up the kit while I took pictures documenting the process. The first thing he did was set up a Large MultiDome softbox, supported by a Photoflex Reflector Connector. This connector is similar to other strobe connectors, only the opening houses a flat reflective metal disc, which is designed to reflect light from the shoe mount flashes back out through the front of the soft box. Next, James set up a Medium LiteStand, attached a Heavy Duty Swivel to it, and then mounted the Dual Flash Adapter Kit onto the Swivel. Once this was set up, James attached the MultiDome and Reflector Connector to the Dual Mount Flash Hardware. Once the two units were connected, James closed the flaps of the soft box to prevent light from leaking out the back. Here’s a look at the Reflector Connector and Dual Flash Adapter Kit inside the MultiDome. There are four cold shoe mounts to accommodate your shoe mount flashes and wireless receivers. For this shoot, I wanted to really warm up the quality of light by inserting four gold panels into the MultiDome. 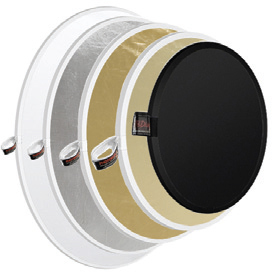 These panels are reversible with silver on the other side, so you have several configurations you can choose from with this type of soft box. Once the panels were inserted, James then mounted two wireless receivers to two of the cold shoes. These receivers would then be synced with two speed lights. Once the receivers were in place, James then mounted the two shoe mount flashes to the other two cold shoes. As you can see, the flashes point (and will bounce light) into the back of the softbox and Reflector Connector. Here’s a look at the setup without the internal baffle or front face of the baffle attached. As you can see, it’s nicely self-contained. Next, James attached the internal baffle, which would help to diffuse the light even more, and then attached the front face. With the soft box now set up, my main objective was now to determine where to shoot. I wanted to keep things simple and decided to shoot against a window, rather than on a seamless paper background, in order to to gain a little natural back light. It happened to be an overcast, somewhat snowy afternoon, and the light coming through the window was relatively soft and diffused. I arranged a small trampoline for the shoot so James could get some extra air in his jumps. Being in good shape, James didn’t really need a trampoline to jump high, but I knew I’d need him to jump repeatedly throughout the shoot and the trampoline would definitely make this easier for both of us. We set the trampoline up in front of one of the studio windows, and James took a few practice bounces. In reviewing the test shots, I saw that the MultiDome I was using was being reflected into the window. While this wasn’t really a big problem, since I’d be dropping out the background anyway, I realized it might interrupt the overall lighting with its hard reflection in the window. So just to be safe, I taped a 77″x77″ sheet of LitePanel fabric to the window, which would do away with the hard reflection and still allow the light from outside to come through. When I was shooting, I was directly underneath the softbox. With everything dialed in, James grabbed the electric guitar and prepared to rock out. James ended up jumping for five minutes stretches while I shot away. We had to wait a few seconds in-between shots in order to let the flashes recycle, but after a while, we both got into a rhythm. At the end of each 5-minute jumping session, James would have to take a few minutes to catch his breath. After the shoot, we each went through the outtakes separately and selected our favorites. These were the selects that made it into the favorites list. Of the bunch, I felt like this was one of the strongest and decided to work on it first. I opened up the image in Photoshop, used the Pen tool to draw a path around James, made a background layer of pure white and deleted the original studio background. As you can see, at this point I had a nice clean shot of just James in mid air with no distracting background to contend with. Notice the rich, warm skin tones? These are due to the gold panels in the MultiDome. Next, I wanted to see what the image would look like in grayscale, so I converted the layer of James to black and white. Thanks to the high quality of lighting in this shot, this black and white conversion resulted in no loss of image quality and had just as strong an impact as the original. Next, I wanted to see how well the image held up with an all-black background underneath. Again, just as good. Finally, I decided to utilize the richness of the original capture and create a graphic background to compliment the warmth of the light. I boosted the saturation and contrast of the James layer just a bit and then created a sunburst background, which seemed to compliment the shot nicely.